Die Klimazwiebel: A cloudy or a sunny future ? A key factor in determining future global warming is the reaction of the clouds to rising temperatures: if cloud cover diminishes or clouds reflect less solar radiation they can exacerbate the effect of CO2: by the same token, they can moderate the warming if they become more extensive or more reflective in the future. Since climate models are nor particularly good at simulating clouds, this is the most important single source of uncertainty. 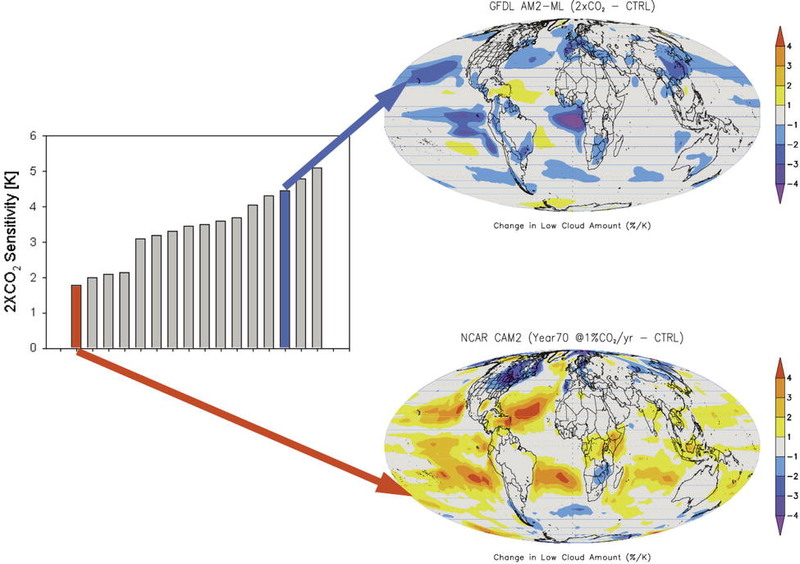 The following figure, taken from one of my favorite papers,Stephens 2005, shows the simulated changes in cloud cover in two simulations driven by the same scenario of increases in atmospheric concentrations of greenhouse gas. (Figure caption taken directly from Stephens paper) The response of a number of present-day climate models forced by a 1% yr−1 increase of CO2. Shown is the difference of the 20-yr average of the simulation with fixed and increasing CO2. The averages are over years 1961–80; corresponding broadly to the time of a CO2 doubling. To the right are the changes to low clouds averaged over this same period for two models that fall on either end of the projected warming range (courtesy of B. Soden). Clouds can modulate the warming, but not offset it. Clouds are a key factor in modulating anthropogenic warming. How good are climate models are simulating cloud formation and evolution? Unfortunately, not that good, for several reasons. One is that the resolution of climate models is too coarse to properly simulated clouds. Currently, the mesh size in a typical climate models is about 150-200 km, whereas clouds processes play out in much smaller scales of a few hundredths of meters or a few kilometers. This limitation forces climate modellers to try to represent cloud properties, formation and evolution by semi-empirical equations that might not be realistic enough. Also, there are many different types of clouds, as everyone can observe. Each type of cloud has different radiative properties. For instance, ice clouds are quite transparent to solar radiations but are very good absorbers of infrared radiation. Their therefore strongly contribute to the greenhouse effect. boundary layer tropical clouds, on the other hand, mostly reflect solar radiation and have a net cooling effect. Observations of cloud properties on a global basis are difficult to obtain, although nowadays a large effort is being made by remote sensing from satellites and observing aircraft. Stephens points us to an important mismatch between the properties of clouds simulated by climate models and those observed by remote sensing. This particular mismatch is related the so called optical depth, a measure of the the amount of solar radiation that is reflected by a a cloud. Optical depth is influenced by the amount of water contained in a cloud (more water means large optical depth) and by the droplet size (smaller droplets cause a large optical depth). Wetter clouds have in general larger optical depths and thus reflect more solar radiation. In a warmer world clouds are expected to become wetter and thus more more reflective of solar radiation. What Trenberth and Fasullo find is that, despite this increase reflectivity, cloud cover itself diminishes in enough amount for the total affect of cloud changes to reinforce the warming. Stephens, in a short newsletter article, argues that the changes in cloud reflectivity are too small in climate models and thus the negative feedback of individual clouds is underestimated. 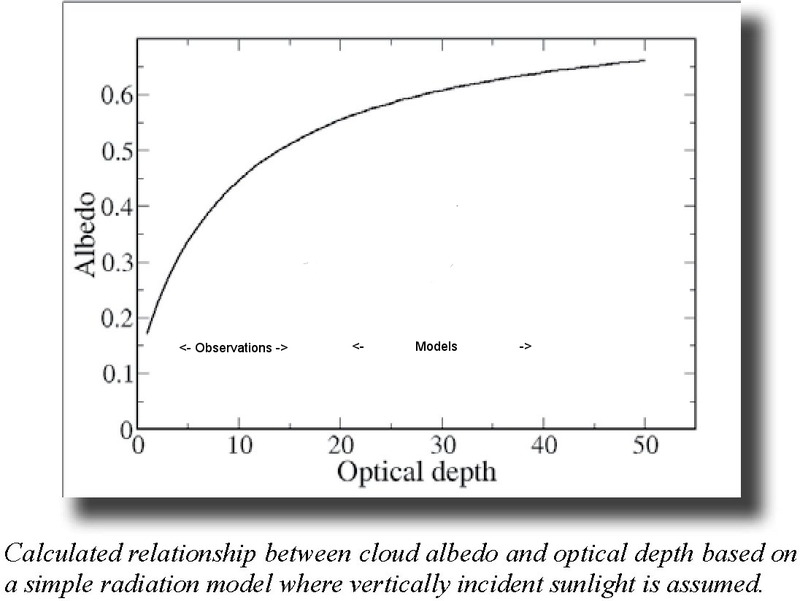 This can be understood by looking at the following figure, displaying the relationship between optical depth (for us here roughly equivalent to cloud wetness) and reflectivity. This relationship is non-linear, meaning that it tends to saturate at higher optical depths: if the optical depth is high, in the range of 40 for instance, the reflectivity cannot increase very much. ;If the optical depth is rather in the range of 10, the reflectivity still has some leeway to increase if the optical depth increases as temperature rises. What Stephens finds is that climate models tend to produce clouds in the upper ranges of optical depth, whereas observed clouds are in the lower ranges. These differences cannot be explained by measurement uncertainties and seem to be real model biases. If this is true, the consequence would be that climate models would be underestimating the negative feedback under warming of a typical cloud. The climate sensitivity of an atmospheric GCM that uses a cloud-resolving model as a convective superparameterization is analyzed by comparing simulations with specified climatological sea surface temperature (SST) and with the SST increased by 2 K. The model has weaker climate sensitivity than most GCMs, but comparable climate sensitivity to recent aqua-planet simulations of a global cloud-resolving model. Other groups have tried to establish the sign and magnitude of the cloud feedback by analyzing the co-covariations of temperature and cloud cover, for instance Lindzen and Choi or Clement et al. The target here is to see whether cloud cover increases or decreases in years when temperatures have been higher than normal. The difficulty is that the measured temperature is also affected by the cloud cover itself, so that it is not easy to establish that the changes in cloud cover have been caused by the changes in temperature, or viceversa. More interestingly would be to establish whether periods in the past, as the Little Ice Age, which were colder because the sun was weaker and the CO2 concentrations lower, were also more cloudy (or less cloudy). As you can imagine, the challenge of reconstructing cloud cover in the past centuries or millennia is daunting, but there are hints that some biological proxies are indeed capable of archiving information about past solar radiation at the surface. This could help, hopefully, to reduce the present uncertainties. Thanks for this. I agree this seems to be one of the most important uncertainties, and something I've wondered a bit about. I find it interesting how what is essentially the same phenomenon can simultaneously have so many positive and negative feedback effects (with temperature being both a dependent and independent variable + nonlinearity). Cloud formation seems to be one of the more used counter-arguments to dominant global warming theory because it leaves so much room for uncertainty, allowing for a wide range of ideas - like the cosmic ray hypothesis. Stephens (2005) lists some "reasons to expect progress in the coming decade" on the reduction of this uncertainty. I wonder how that is coming along. This is interesting and an important question. I would like to see more posts on the details of the science from Hans and Eduardo, please! I don't find the Trenberth paper very convincing. It seems to show his bias - or at least the bias that is inherently in the models. He says that warmer temperatures lead to more evaporation so more water vapour and so more greenhouse effect, but also that warmer temperatures lead to less cloud and so more direct solar heating. This double positive feedback seems inconsistent. If there is more water vapour I would expect more cloud, not less. What is the physics behind the claim that higher temperatures give less cloud? The Stephens paper seems to give evidence that warmer temperature gives more cloud as I expect hence -ve feedback. It also gives an argument for +ve feedback but this is very vague ("may well" , "suggesting") and not at all convincing. In a warmer climate, there will be more water vapour and there will likely be more clouds in terms of mass of water. But it is also likely that clouds will be more convective, i.e. developed vertically. So it is not very sure whether the fractional area covered by clouds will increase or decrease. As the capacity of modeling increases, global cloud-resolving models will give more confident answers. Of the approximately 340 W/m2 of solar radiation that is incident on the top of the atmosphere, 100 W/m2 is reflected. Of this 70 W/m2 is reflected by clouds. Because some clouds form over bright surfaces, in the absence of clouds the planet would still reflect roughly 50 W/m2 of the incident solar radiation. So clouds have an albedo effect of 50-70 W/m2, depending on how you count. In contrast the effect of doubling CO2 is commensurate with a change in the radiative forcing of about 3 W/m2. Which is to say that small changes in the planetary albedo can have very large implications for climate. So understanding what controls the planetary albedo, principally clouds, but also the distribution of sea-ice or the character of the land surface, is paramount to understanding the behavior of the Earth system. • What determines the planetary albedo, and how different could it be? • Is the hemispheric symmetry in the net amount of reflected solar radiation an accident? • How does the planet respond to changes in planetary albedo? • What determines the distribution of snow and ice, including sea-ice? • Why is the ITCZ north of the equator? To me the question arises: How it can be claimed that the science on global warming is settled? "reasons to expect progress in the coming decade" on the reduction of this uncertainty. I wonder how that is coming along. I may not be completely well informed about the latest developments, but progress seems to be slow. It is a hard problem because it involves all spatial scales, from the microscopic - droplet formation and size - to the large-scale, as clouds influence the larges-scale atmospheric dynamics and are affected by it as well. Moreover, we should keep in mind that there is not complete theory of turbulence. My feeling is that with some more years of satellite data the uncertainties will narrow. I know, this sounds like an excuse..
the reactions of clouds to warming may be multifaceted: if the atmospheric dynamics change, for instance anticyclones or storm tracks shifts their position, clouds will tend to form in other areas. Or clouds may form more frequently over land, or over the ocean, or over ice.-- the surface reflectivity is different in all these cases, so that if for instance more clouds are formed over ice where the albedo is already high, the effects of those clouds wont be as large as if they formed more frequently over forest areas. So the equation , more water vapor = more clouds is only partial. Th equation more water vapor = wetter clouds seem to me more robust. science is never settled. Climate science or any science. The question is not whether it is settled. the question is 'how settled' it is to justify action, and that depends on the question 'action for what'. For new medicines, science has to be 'very settled': to implement new laser technologies in DVDs perhaps not that settled. The Twomey theory is wrong because it only applies to thin clouds. The physicists apparently knew this by about 2004 so AR4 was based on known poor science. The approximation, borrowed from Bohren, only concerns optical depth. In the absence of adsorption the maximum predicted albedo of a thick cloud is 0.5, far less than the typical experimental 0.7, and I have seen 0.9. Also, the satellites show an angular albedo dependence incompatible with a Lambertian light source and there is no significant difference in cloud albedo between the polluted northern and unpolluted Southern hemispheres. The explanation is another optical effect which operates at the tops of clouds. You can observe it when the sun is low. It's probably based on the energy concentration by particles [which comes from Maxwell's equations] in line of sight with the sun leading to much higher backscattering from subsequent interactions than one would intuitively expect. The theory is hideous but the dependence on particle radius, a sixth power effect, more than makes up for the reduction in droplet number per unit volume as size increases. Conclusion: climate scientists have deluded themselves because the people in charge didn't have the intellectual horsepower to check one of their most basic assumptions. There is no significant aerosol effect of the second kind. Since the models depend on this for their credibility, the models are wrong and or their calibration is wrong. Back to the drawing board to get it right. PS NASA literature gives a false scientific explanation of the Twomey effect ['increased surface area for smaller droplets'] which may be part of the problem because it has (i) lulled the science into a false sense of security and (ii) because it appears to be what is taught to undergraduates fools them from the very start. Climate science is insufficiently rigorous. But you can say that of most science nowadays apart from physics at the top institutions. Essentially, he studied thousands of paintings between 1400 up to 1967 and measured the cloudiness. I can't find the original article but the results are intriguing and there are some references online, e.g.